The UN Assistance Mission in Afghanistan (UNAMA) denounced the attack in Gardez city, about 50 miles south of Kabul, when two suicide bombers detonated their explosive vests. According to news reports, the Taliban has denied any links to the attack and there was no immediate claim of responsibility, but militants linked to the ISIL terrorist group, also known as Da’esh, have carried out similar attacks against Shiites in the past. “These brutal and senseless attacks against people at prayer are atrocities,” said Mr. Yamamoto. International humanitarian law prohibits deliberate attacks against civilians and civilian property, including places of worship. It also commits warring parties to allow religious leaders to serve their communities without fear of attack. “Such attacks directed against congregations and places of worship are serious violations of international law that may amount to war crimes,” he stressed. UNAMA expressed its condolences to the loved ones of those killed and wished the injured a full and speedy recovery. The latest terrorist assault comes on the heels of a suicide attack and hostage-taking at a government building on Wednesday, in the eastern city of Jalalabad. According to mid-July figures from UNAMA, 1,692 civilians had been killed and another 3,430 injured in the first six months of the year. This sets a record high for the first six months of any year, despite an unprecedented days-long ceasefire between the Government and Taliban extremists in mid-June. Terrorism is "criminal and unjustifiable"
The Security Council also issued a statement condemning “in the strongest terms, the heinous and cowardly terrorist attacks" that took place over the past week. They expressed their deepest sympathy to the victim’s families and the Afghan Government, and wished those injured a full and speedy recovery. Finally, they reaffirmed the need for all States to combat by all means, in accordance with the UN Charter and other obligations under international law, threats to international peace and security caused by terrorist acts. 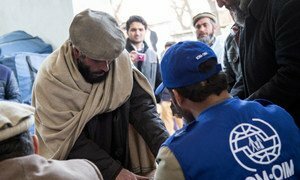 The death of a local United Nations staff member in a suicide attack on Wednesday in the city of Jalalabad, has highlighted the tragic and relentless effects of terrorist attacks targeting civilians across Afghanistan.